Literature on the topics of yoga, Ayurveda, meditation, ritual, healing and whole living. Featured on wellness publications. Written by Gaby Colletta. Let’s face it: being human isn’t easy. Everyday we are called by curiosity, challenged by confusion and contradiction, confronted with choice, provoked by wonder and awe. “At the center of non-violence stands the principle of love.” – Martin Luther King Jr.
On the surface it seems simple, yet the embodiment of this principle penetrates the deeper layers of our being. Satya is the second Yama or moral constraint of Patanjali’s Eight Limbed Path of Yoga. In its essence, Satya is our inner truth compass. The Sanskrit derivative “sat” translates to “true nature.” It is the principle that holds a mirror to one’s face and asks for a raw and honest look at one’s thoughts, words, and actions. 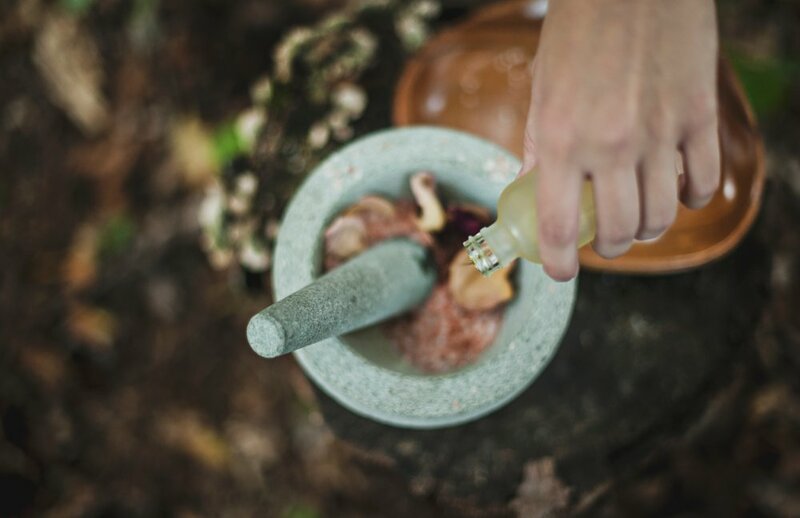 Herbal medicine making is a powerful practice rich with intention, connection, and healing. In our modern world, the potency of plant medicine is often overlooked. Yet when we trace its roots, we see that Mother Earth's remedies are long honored across many traditions and cultures. Food is ritual. It is a practice we partake in every day, and one that sustains our longevity. Often what we eat and how we eat go unnoticed or unappreciated in our daily routine. The Sanskrit word “sadhana” means spiritual practice. Our food sadhana or how we consume that which nourishes us is sacred. While much of the Western World is acquainted with the Ancient practice of Yoga, few know of its deep connection to Ayurveda, the science of life. The science of Ayurveda draws wisdom from the elements of Earth, Water, Fire, Air and Ether. Believe it or not, the qualities of these elements appear in a yoga practice. Each asana pose carries an energetic remedy. Understanding how to use the elements in your asana yoga practice will help you bring balance and harmony within. Turmeric, botanically known as Curcuma longa, has long been revered as a sacred plant for healers of many traditions. Used as food, medicine, and in ritual, this rhizomatous plant holds a well-respected power. Yoga Nidra is one of the most powerful practices for self-healing. Only recently has the Western World discovered its transformative medicine. Today, this Ancient Yogic technique of relaxation is used to remedy suffering across the board: from anxiety, stress and PTSD to insomnia and cancer – these are just a fraction of the conditions healed. So what is Yoga Nidra?.